Incredible Views! Beautiful Cabin! Well Appointed Decor! Hot Tub! A+ Location! Bearfoot Cabin is sitting at 2,200 ft. viewing the peaks of Rich Mountain Wilderness at 4,100 ft. This cabin is only a few years old and stands out in comparison to other cabins regarding comfort and layout, , location, mountain views, and meticulous thought with regard to details. Similar cabins are priced 25 percent above our cabin. This beautiful mountain cabin offers the opportunity for you to let all your cares wash away whether it be for a romantic get-away, a wonderful family experience, or a time with friends. Our cabin offers a fully equipped kitchen, family room with 46 inch flat screen TV, two bedrooms with queen size beds, a wonderful upstairs master suite with a king size bed, a flat screened TV, a master bath with a double vanity and it's own private 12 X 10 deck overlooking the north GA mountains. The loft has a day bed and trundle and it's own half bath along with a sitting area and a flat screen TV and gaming system. Step outside onto the oversized porch with plenty of sitting area, grill a steak and eat at the table on the porch, or relax and stargaze in the warmth of the wonderful hot tub. While you are here, don't miss the incredible outdoor experiences, browsing and shopping in Blue Ridge or Ellijay just minutes away, or enjoy some of the finest dining experiences in the south. Hiking is at your backdoor as the Benton McKaye Trail, a feeder trail for the Appalachian Trail, literally runs throughout community. Enjoy fishing in the community on one of its many small lakes. Within twenty-five minutes you can enjoy the outdoor experiences within the Aska Adventure Area including hiking, waterfalls, and tubing. If you enjoy lakes, don't miss Blue Ridge Lake moments away. If you are in for a hardy rafting experience, the Ocoee is less than an hour. For those with a bit more tranquil desire, take a ride on the Blue Ridge Scenic Railway to Copperhill, TN, play putt-putt, mosey through the shops of Blue Ridge or Ellijay, take a helicopter ride, or picnic. Don't miss out on one of the many BBQ restaurants, the fudge or ice cream. For those on taking a romantic get-away, after relaxing at the cabin head into downtown Blue Ridge and enjoy the fine dining at Harvest on Main, Treo, or the Black Sheep. Each cabin that we own and manage (three) sit adjacent to one another on over an acre each providing privacy. They are located on Cherry Mountain in Cherry Log, GA, just fifteen minutes south of Blue Ridge, GA. These investments were made to provide our guests with the best experience possible as they enjoy the beauty of the North GA Mountains and the surrounding area. At our cabins, you can always expect a spectacular view, wonderful location, extreme attention to cleanliness, privacy, very competitive pricing, beautiful cabin decor, attention to detail for your comfort, and always personal and helpful service. We are the Brinkley’s. My name is Matt and my wife is named Vickie. I am a minister and my wife is a retired teacher. We live in Roswell, GA and have three grown children and four grand children. We are thrilled to have built this beautiful cabin in 2014 literally on the lot next to our first cabin. For years we would take a romantic get-away in the North GA mountains. The time was always relaxing and much needed. In 2012 we purchased our first cabin as an investment allowing others to enjoy a wonderful mountain experience as well as ourselves. Last year we decided to purchase the land and build a cabin next door to our current cabin. The purposes were two fold... 1) because our first cabin was a successful venture and; 2) we wanted the privilege to bring our whole family to the mountains, and by building on the land next door, we could all come. By the way, check out VRBO #407254. If available, you might want to rent both cabins to accomodate a larger family or group of friends as well. As mentioned on the description page, the location of this cabin is great for everything from a week long vacation to a weekend get-away. We are less than an hour and a half from downtown Atlanta and just over that to the airport. The location of the cabin is extremely accessible taking major highways until you reach the Cherry Mountain Community which is located just 12 miles north of Ellijay and seven miles south of Blue Ridge. Once you reach the turn into the community you take a seven minute drive into the community where, while you are close to everything you could possibly need for fun, recreation, and eating, you feel 'away from it all.' I like to use the phrase... 'So close, yet so far away.' Vickie and I consider it a privilege to own the cabins and thoroughly enjoy all aspects of the process... particularly getting the opportunity to offer others a true mountain experience in a relaxing well kept environment. Thank you for considering our cabin and let us know if we may serve you! Enjoy the beautiful 4.100 ft. peaks of the Rich Mountain Wilderness in North GA mountains. All major carriers have great reception. Our den offers cozy mountain decor along with a 46 inch flat screen TV above the fireplace. Fully equipped kitchen. FYI... Mr. Coffee coffeemaker. Additional chairs can be added around the dining table. Corn Hole. Board games in loft. Wonderful trail leading to fire pit and hammock. Incredible balcony located off of the master bedroom with an incredible view. Other similar properties in the area rent for $175+. We offer this wonderful property at a discount due to the fact it is privately owned and cared for giving us the opportunity to pass the savings on to our guests. Great cabin, great location, great price. We thoroughly enjoyed our Spring Break getaway at the Bearfoot Cabin! Matt was very easy to work with and provided all the information we needed in a timely manner. The cabin was extremely clean, beautifully decorated, and well equipped. We had 3 perfect-weather days in a row, so we spent a good bit of our time hiking some of the great trails in the area. We ate a few meals at the cabin, and also enjoyed some of the great local restaurants in both Blue Ridge and Elijay. I would highly recommend this cabin to anyone looking for a great cabin, in a great location, for a great price. I have trusted VRBO for many, many years when locating a vacation rental. This one was more than expected for this family of 5. Wonderful view, fully loaded kitchen, and convenient to shopping and outdoor activities. The cabin decor was so lovely and it made our stay feel more like visiting a friend than renting. We didn't want to leave! Thanks so much for a fantastic experience. Look no further. This is a clean and very well maintained home. 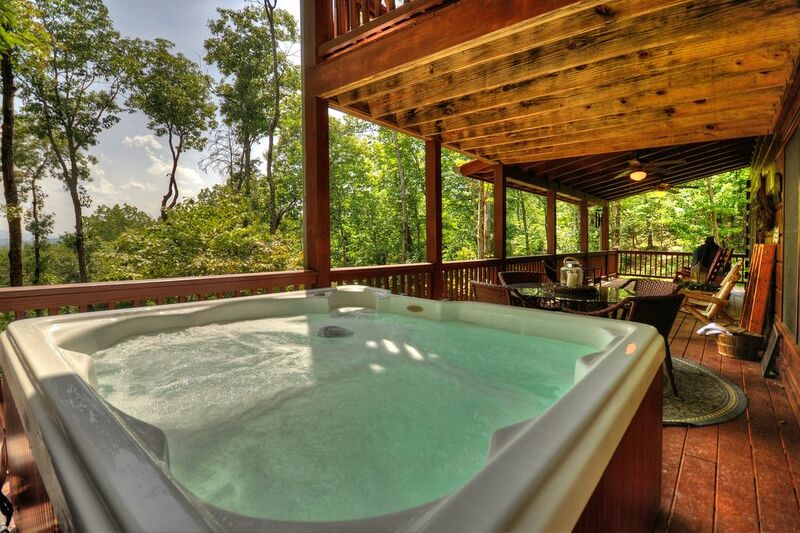 The views are incredible, and can be enjoyed from the fire pit, porch, hot tub or 2nd floor porch. - Road to get to this location is a typical mountain road, with a number of turns, and steep and narror in some places. We took it slow and had no issues. We were glad we arrived in the day light which helped with finding the place the first time. - Visited Mercier Orchards and the town of Blue Ridge that offers a few shops, restaurants and bars. Thank you for your review. Just wanted to give a bit of clarity on the roads... while the short mountain road leading to the cabin does wind around and does have some steeper grades leading to the Cabin where you will experience incredible views, they are easily navigable in any regular car and do not pose any threat of danger to our guests. My friends and I really enjoyed our stay here. The cabin is clean and cozy with a gorgeous view. It rained most of our stay, so we had a fire going every morning and evening and it was so relaxing! Just what everyone needed. We got to soak in the hot tub a couple of nights in between rain showers...a nice experience before climbing into bed. It was a great escape to the mountains! Perfect mountaintop cabin with spectacular views! We loved Bearfoot cabin! My husband and I along with our friends stayed at Bearfoot cabin for 2 nights in February. We loved the amenities the cabin had to offer and we enjoyed the spacious kitchen/living area as well as the hot tub and porch with beautiful views! The location was perfect, just about a 10 minute drive to both downtown Blue Ridge and Ellijay. It was really nice. Very clean and neat. Plenty of room for my family of 5 with room for more... We only used 2 rooms... There was another room plus a loft... WE LOVED IT!!! Definitely will stay again! Yes, this wonderful cabin's location offers its guests a true mountain experience with an extraordinary view. It also offers the convenience of enjoying the amenities of civilization only twenty minutes away in the quaint mountain town of Blue Ridge offering some of the best BBQ in the south to casual country cooking to upscale dining experience. And yes, if you prefer McDonald's, it is there as well. Our cabin is located in the perfect place for outdoor recreation including hiking, tubing, lake access close by on Lake Blue Ridge, whitewater rafting, fishing, picnics, browsing the shops of Blue Ridge or Ellijay and more.